Watson would look to play an important role in Australia’s comeback trial in the series. Australia's experienced all-rounder Shane Watson believes his compatriot Steve Smith and India batsman Virat Kohli have a big but healthy rivalry between them to be the most incredible batsman in the world at the moment. After beating India in the five-match One-Day International (ODI) series 4-1, the hosts find themselves in a tough situation as they trail 0-1 in the three-match Twenty20 International series against visitors India. India beat Australia by 37 runs in first T20I on Tuesday. Australia face India in the second match at the Melbourne Cricket Ground on Friday. During the first T20I, Smith had been doing a live interview with Channel Nine commentators Mark Nicholas, Ian Healy and Michael Hussey in the over of his dismissal, but was not speaking in the lead-up to the ball which got him out. Following his dismissal, Kohli gave a feisty send off to Smith for giving live interview during the match. "Virat is a very excitable dude anyway so he gets involved in a contest. And obviously him and Steve have got a big and healthy rivalry as well for the most incredible batsman in the world at the moment," Watson said at the pre-match press conference. "I will be very surprised if that affected the way Steve bats and he knows when to switch on. Virat plays with his heart on his sleeve and I certainly know that from experience. He sometimes gets into trouble because of it, but that's the thing that drives him as well," he said. Watson heaped praise on young India pacer Jasprit Bumrah, who impressed with the ball both in the fifth ODI and first T20. "Seeing him in the Indian Premier League (IPL) for Mumbai Indians, he has done incredibly well for them. He bowls at good pace and he is different from the way he swings the ball into the right-handers. Bringing the brand new ball in, he is able to execute his yorkers very well so there is no surprise that he has come into the Indian team and done very well," the 34-year-old said. 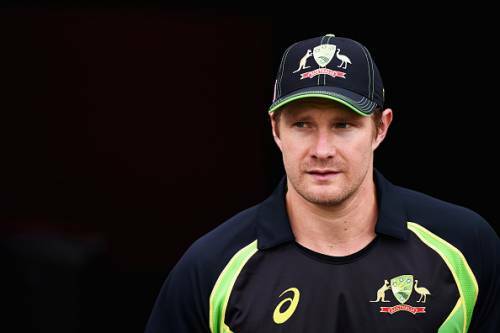 Speaking on the reason why Australia have struggled in the shortest format of the game compared to other formats, Watson said, "It is challenging with T20Is. Apart from the World T20, there really isn't that much riding on the series apart from national pride and wanting to win for your country. "There is no rankings or big sort of things around and its pure entertainment value, and it certainly provides a lot of entertainment," Watson concluded.